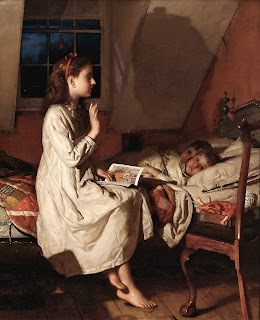 I love the sweetness of big sister reading a bedtime story to her little brother and little chinquapin-eyed sister. You have a hint of the story from the title of the painting, but you can see the picture in the book if you enlarge the image. on the dormer above the bed. Do you see the shadow of the hairbow? Now, while your eyes are up on the shadow, do you see peeling paint? Look in the chair. Sweet little doll in her box-bed with her crocheted nightcap. Notice the rough floorboards and the delicate bare feet which rather mirror the lilting hand. Big sister's earring hangs so gracefully. Have you noticed the color theme? Sienna orange walls and the same sienna orange hairbow? The most curious item in this painting to me is the little slate hanging on the wall beside little brother. What do you think that is, and why is it in that position? Seymour Joseph Guy is becoming a favorite (American or English, which is it when one immigrates?) artist of mine. You remind me of my beloved Latin teacher. He would always point to parts of the picture and ask questions. I particularly love the girl's lifted hand. Her participation in the reading seems more vivid because of that hand.